Fantastic and informative read. Insightful. Criminals Will Hate This Book. Long-held myths defining the sources of and cures for crime are shattered in this ground-breaking book--and a chilling profile of today's criminal emerges. --This text refers to an out of print or unavailable edition of this title. I received this book in exchange for an honest review from Blogging for Books and I wasn't disappointed. First off, I hesitated reading this book. So often, books about criminals praise criminals and make excuses trying to excuse their crimes. There is no excuse for a crime; just someone wanting instant gratification without paying for it. This book, however is a refreshing read. The author, a respected psychologist says what most rational thinking people knew all along: Criminals commit crimes because they want to. There is no extra chromosome; no poor, abusive environment, or bully in the criminal’s past that caused the criminal to commit a crime. Committing a crime is a voluntary action and the author does an excellent job in demonstrating that. Responsibility belongs to the criminal in both committing a crime and really wanting to change. As this book illustrates, there is no magic formula that will change an inmate. Give him all the education and support and all a criminal will do is use it to commit his next crime. In other words, don't pit a criminal. Don't think you can change one. Learn how they really think. Protect yourself and your loved ones by reading this book. Overall, this is a well written and informative book that goes inside the criminal’s mind. Sorry, criminals and all those that believe their excuses: There are no excuses; no justifiable reasons to commit crimes. It is simply a matter of choice. To commit or not commit a crime is up to you, and this book does a fantastic job of proving that. 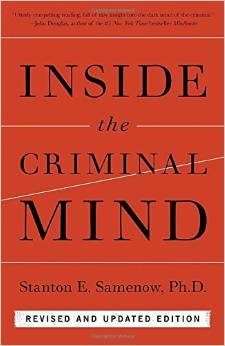 STANTON E. SAMENOW PhD, is a clinical psychologist who has spent 40 years as a researcher, clinician, consultant, and expert witness specializing in criminal behavior. He has also served as an independent evaluator in adversarial child custody disputes and has been appointed to three presidential task forces on law enforcement, victims' rights, and a drug-free America. Among numerous other national venues, he has appeared on 60 Minutes, Oprah, Good Morning America, and Larry King Live. In addition to Inside the Criminal Mind he is the author of Before It's Too Late and Straight Talk About Criminals.